When you’re on the clock, there’s nothing more irritating than wet socks in drenched boots. 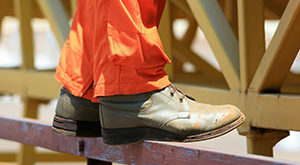 Not only is it uncomfortable, but in many work environments wet boots can be a safety hazard. 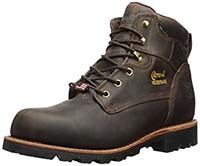 Whether you work in the agricultural industry or in construction, it’s important to keep your feet dry, safe, and comfortable by investing in waterproof work boots. Waterproof boots allow you to wade through water, oil, gas, and more without having to worry about a thing. 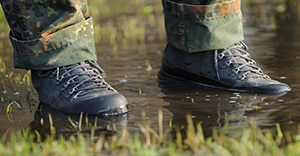 In standard boots or shoes, stepping into fluids will instantly flood your feet and lead to a number of issues. You can easily slip and fall, experience blisters, and much more. In the long run, your boots will never be the same. They’ll be deformed and turn into a breeding ground for mold and bacteria. It’s best to just avoid these issues altogether with a pair of boots you can trust. Here are 7 of the best waterproof boots made for wet conditions. These boots are made from a unique material that’s designed to be durable and waterproof. The Ever-Guard leather is used on the uppers. It’s also used to reinforce certain parts of the boots for added protection. The material is very resistant to heat, abrasions, and water. The boots utilize welt construction for further protection from moisture. The sole is made from a synthetic material and has a tread design that’s slip and oil-resistant. Inside, the boots have a breathable mesh lining. This helps to keep your feet dry from sweat. The boots have a standard 6-inch shaft. 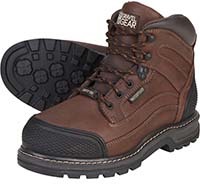 If you’re looking for the best in support, comfort, and protection, these boots are a great option. They’re specifically designed to improve the position and movement of your feet. This is done throughout a contoured footbed, shank supports, shock-absorbing cushions, and much more. The upper is made from a waterproof leather that helps to repel moisture. It has a standard 6-inch shaft. The bottom of the shoes are made from durable rubber. The outsole is reinforced for support along the foot. The connection point between the uppers and the outsoles are also smooth and reinforced to prevent water penetration. These boots from Timberland have a unique look and plenty of safety features to keep you protected. The uppers are made from waterproof leather. On the toe, there’s a softer rubber cap for further moisture protection and comfort. The shaft of the boots measures 8-inches high from the arch. The soles are made from durable rubber and have a lightweight fiberglass shank built in for support and stability. Inside, the boots have a breathable mesh lining that can help to speed up the evaporation process of sweat and keep odors under control. There’s also dual-density foam and a shock-absorbing insole for comfort throughout the day. This pair of boots has multiple layers of protection to keep you dry. On the outside, the uppers are made from top-grain leather. The leather uppers are waterproof, durable, and extend up 6 inches from the arch of the foot. It’s connected to the Vibram Cascade synthetic outsoles with welt construction for a tight seal. Beyond that first layer of protection is a bootie. This bootie is completely waterproof. There’s also a waterproof insole and a moisture-wicking lining. The sole has a steel shank for added support and is built to be replaceable so that you can extend the life of your boots. This option from Ever Boots is made with a variety of waterproof materials. The uppers are made from waterproof full-grain leather. It’s attached to the rubber soles using a direct attach method. The two components are tightly sealed to prevent water penetration. Beyond that, the boots use waterproof laces, stitches, and booties for lasting protection. There’s also an insulated lining inside, making it a perfect option for winter environments. A polyurethane midsole is also included to support your arch and prevent premature fatigue as you work. Overall, the boots are lightweight and flexible to provide you with full agility and movement. 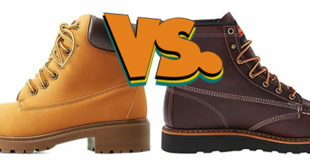 The Flume line of boots from Timberland are designed to be used in wet and slippery environments. The manufacturers utilized a seam-sealed construction method. There’s no gap between the uppers and the outsole. The various seams are reinforced and covered for ultimate protection from moisture. The uppers are made from leather while the outsoles are made from rubber. The boots extend approximately 5 inches up from the arch. The outsoles feature a design that improves grip on a variety of smooth surfaces. To ensure that your feet are comfortable, the boots also include a removable footbed made from absorbent EVA foam. 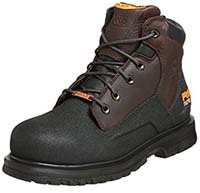 With an ASTM-approved steel toe cap, these boots give you versatile protection from a number of workplace hazards. When it comes to waterproofing, the boots have a couple of different layers of protection. The first is waterproof uppers made from soft full-grain leather. The second is an inner waterproof membrane. This membrane provides complete protection from moisture. There’s also a mesh lining to wick away sweat. A mesh-lined insole is also included for added comfort and protection from sweat. The outsole is comprised of two layers. One is a layer of polyurethane while the second is slip and oil-resistant rubber. When you’re shopping for boots, you’ll likely come across the terms “Waterproof” and “Water-Resistant.” They’re used by manufacturers to help give you a better idea of the capabilities of the boots. Problem is, it’s easy to get these two mixed up. 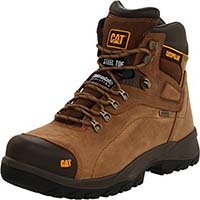 Waterproof means that the boots are completely safe to be used in wet conditions for prolonged periods of time. You can stand in water without worrying about it getting in. 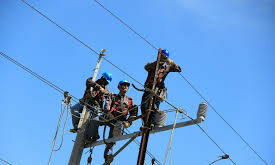 The unique features that provide this benefit are built directly into the boots during the construction phase. On the other hand, water-resistant boots only provide temporary protection. The protection features are more of an afterthought that will fade away with some time. These types of shoes are often sprayed with a water-resistant material rather than having features built right in. They can hold up well to the occasional splash, but they won’t hold up to more extreme environments. If you’re looking for the best protection possible, waterproof boots are the way to go. 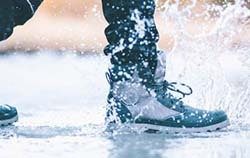 To ensure that your feet are truly protected from water, oil, gas, and any other liquid you may be working around, there are a number of features you need to look out for. 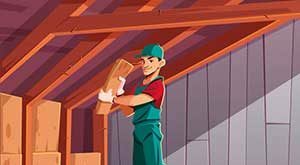 As mentioned earlier, these features are a part of the overall construction of the boot and can help your investment last for many years to come. One of the first things to look for is the material of the boots. 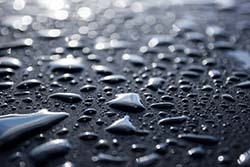 Options like canvas or nylon, while durable, are the worst in terms of water protection. Instead, you should go with boots that are made from rubber or leather. Rubber provides the most protection. The material is thick, flexible, and fairly difficult to penetrate. It’s also solid and easy to mold, allowing manufacturers to create a seamless boot fairly easily. Leather is a natural material that holds up very well to moisture if it’s treated properly. Manufacturers typically apply wax sealant to prevent moisture from affecting the overall quality of the material. To ensure that the material stays protective, you would need to apply wax on a regular basis. If your job requires you to wade through water, you need to find work boots with a fairly high shaft. 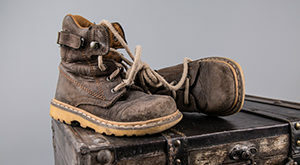 On standard work boots, shafts extend a couple of inches beyond the ankles. This is fine if your only concern is splashes or rain. However, if you were to step into deeper waters, you run the risk of having the water pour in from the top. To avoid this, go with shafts that extend far beyond the ankle. 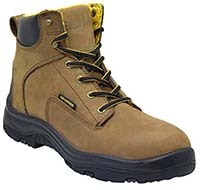 Manufacturers often make work boots in mid-calf designs and knee-high designs. With these options, you can wade through greater depths without a concern. To provide true waterproofing, manufacturers will construct the boots in a way that seals the inside off completely. 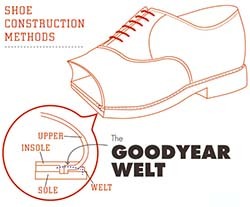 One such method is called Goodyear welt construction. It involves a separate piece of material that runs around the perimeter of the outsole. Essentially, it covers the seam between the outsole and the boot uppers. This area is often the first to be compromised when you step into water. This strip covers the seam and works alongside reinforced stitching, heavy-duty adhesives, and even cork to create a water-tight seal. Other construction methods include using a solid piece of rubber to create a waterproof shell and sealed stitching. Waterproof membranes and liners act as a second layer of defense against water. They’ll prevent moisture from getting in if the exterior of the boot is compromised. Membranes are often built into the walls of the boots. Liners are typically removable. They act a bit differently because they help to control sweat. Certain materials can wick away sweat and prevent bacteria from growing. You should always go with boots that grip well onto whatever surface you’re walking on. Boots can be made to be slip-resistant and oil-resistant. To achieve this feature, a unique design is implemented on the bottom of the outsole. This design includes lugs to grip the ground and channels to redirect water. The end result is better stability and traction as you walk. A pair of waterproof boots can make all the difference on the job. They’ll ultimately affect your performance, comfort, and safety. 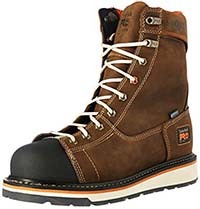 A great pair of work boots will keep the water out to help you prevent blisters, odors, and much more. You’ll be able to jump into any wet environment without a second thought and leave your job feeling dry and comfortable.